Forked River Law Firm, Stein & Supsie | Steven V. Tedeschi, Esq. Steven Tedeschi is admitted to practice law in New Jersey. Mr. Tedeschi is a graduate of Rutgers University – New Brunswick (B.A., 2006) and Widener Law School (Delaware School of Law; J.D., 2014). During law school, Mr. Tedeschi was a member of the Phi Alpha Delta law fraternity, participated in the Martin Luther King, Jr. Semester of Service, assisted with the Wills for Heroes program, and remained active in other school programs. 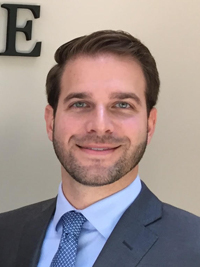 Mr. Tedeschi also studied international law for a semester abroad in Lausanne, Switzerland, and interned at the Ocean County Prosecutor’s Office – Domestic Violence Division. After graduating law school, he was a law clerk for the Hon. Arnold B. Goldman, J.S.C. (Ocean County Superior Court – Civil Division). Mr. Tedeschi currently focuses on Elder Law, Estate Planning and Administration, Estate litigation, residential real estate, guardianships, and education law.